RKGraphix Design Group is a small business located in Harrison City, PA. We oversee a diverse portfolio of online web pages ranging from technology news to tourism. However our main focus is the wedding industry designing sites for photographers, videographers, catering services DJ's and Bands. We also create custom pages for Brides to be which can be used to share guest lists, gift registries, and after the wedding all the wonderful photos and videos can be shared with family and friends. This site is meant to introduce you to our individual projects and showcase the many talents of our dedicated staff. For the last ten years we've been busy honing our skills, not only as web developers, but also as graphic designers familiar with every aspect of the printing industry. If you need illustration work, product photography, flash animation, photo retouching we have a talented individual either on our staff or avaliable to take care of your project. There are links on our about page with sampels of some of the complex projects that we have handeled for clients. 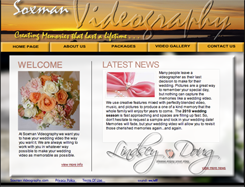 Soxman Videography, is a small buisness located in Tarentum and provides it's customers with excellent wedding and event coverage at affordable prices. Although the web site is still evolving along with this young buisness. The symbol above shows that we care enough about our work to validate every page. Copyright © 2010 RKGraphix Design Group All rights reserved.